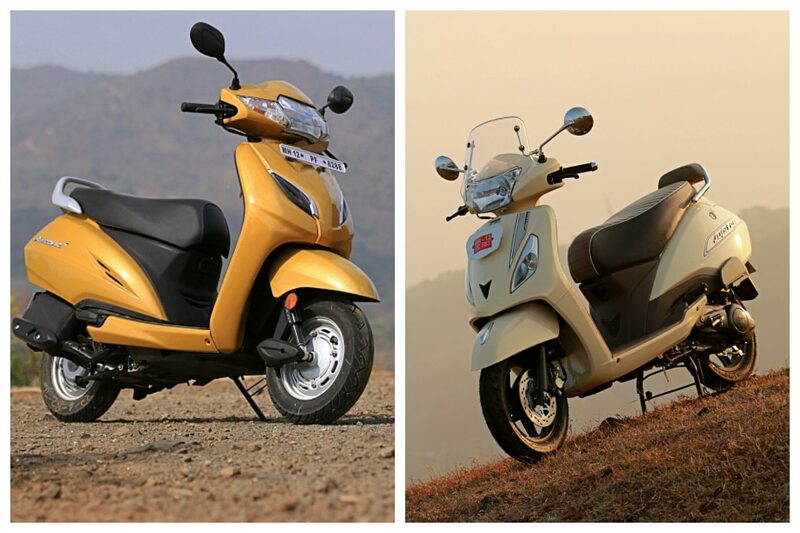 When it comes to scooters, the Honda Activa has been a household name and is also the best selling two-wheeler in the world. Its latest iteration carries forward the same reliable mechanicals but with a fresher look replete with LED headlamps. In comparison, its closest contender, the TVS Jupiter, impresses with its modern suspension setup that gives it an exemplary ride quality, refined motor and a host of features. Understandably then, picking between these two is a tough cookie to crack. Fortunately, we have something that should help you make an informed decision: real-world numbers. Let's get on with it then. Note: The TVS Jupiter tested here is the Classic variant that gets extra bits like a front flyscreen and pillion backrest. The Honda Activa 5G makes a similar 8PS at 7500rpm like the TVS Jupiter but makes a higher 9Nm of torque, which is 0.6Nm more than the Jupiter, at 5500rpm. However, at 109kg (kerb), the Activa weighs 1 kg more than the Jupiter. While the Jupiter is 1.39 seconds quicker than the Activa in the 0-60kmph run, it is the Activa that racks up a higher top speed. Here it is simply a question of hardware. The TVS Jupiter gets an optional 220mm front disc brake that with the 130mm rear drum helps it come to a complete stop 2.37 metres shorter than the Activa. It should be said, though, that the Activa 5G, despite running 130mm drum brakes at both ends, does manage respectable braking times. Here, the TVS Jupiter impresses both in the city as well as the highway run. In the city, it offers 2.34kmpl more than the Activa 5G. Out on the highway, the difference increases to a substantial 11.7kmpl. It seems the Jupiter’s motor’s state of tune and larger 12-inch front and rear wheels help it sustain highway speeds better without stressing the motor. The Honda Activa has been a crowd favourite for its reliable mechanicals and Honda’s brand image. However, the TVS Jupiter is hard to ignore with its refined motor that is not only quick off the line but also offers better fuel efficiency both in the city and out on the highway. Not just that, the fact that it comes with a disc brake (an option missing in the Activa) makes it safer. When it comes to crunching numbers, the TVS Jupiter is our pick here.